The CP Help Center is the web’s largest source for research, treatment and legal news on cerebral palsy. Visit http://www.CerebralPalsyHelp.org today. Now, the CP Help Center has learned that Duke Medical Center has received a $15 million grant from the Marcus Foundation to begin two years of umbilical cord stem cell research, in what is eventually expected to become a five-year, $41 million study. The birth injury patient advocates at CerebralPalsyHelp.org are alerting parents of children with cerebral palsy of new research information on the site. Duke University was recently awarded a research grant to explore the use of umbilical cord cells to treat brain damage causing cerebral palsy and other conditions*. 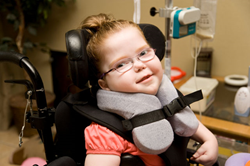 The CP Help Center is a national advocacy center providing the latest on cerebral palsy treatment, clinical trials, resources and litigation news. Parents can learn more about their child’s condition and how it may have been caused, get information on available assistance, and decide if they should seek legal advice. Cerebral palsy affects muscle movement, coordination and posture. It is the leading cause of functional and developmental disability in children in the United States**, occurring in approximately 3.3 out of every 1,000 births, and affecting approximately 500,000 children**. While CP affects muscle function, it is actually a neurological disorder caused by brain damage to the parts that control muscle function***. This usually occurs before, during or after birth***. Cerebral palsy may be caused by factors occurring to the fetus during pregnancy, or by trauma or asphyxiation during labor***. There is no cure at this time, however, researchers are working towards better treatments. Now, the CP Help Center has learned that Duke Medical Center has received a $15 million grant from the Marcus Foundation to begin two years of umbilical cord stem cell research, in what is eventually expected to become a five-year, $41 million study*. Duke researchers will study whether cord blood can help repair dysfunctional or damaged parts of the brain and hope to develop cell-based therapies that could help millions affected by cerebral palsy, stroke or autism*. The study will include approximately 100 children with cerebral palsy, in trials that inject donated cord blood to treat their brain damage*. Anyone whose child has been diagnosed with cerebral palsy should learn more about how their condition was caused, or speak with a lawyer about their legal options. The CP Help Center only recommends lawyers who specialize in cerebral palsy lawsuits. For more information on the research, treatment, causes and litigation news related to cerebral palsy, or to speak with a lawyer, visit http://www.cerebralpalsyhelp.org today.